If you’re going to Iraq from Qatar, you’re going through these doors. Once on the ground the big plane jerks violently to a stop. The back hatch comes down to a blast of heat, adding to the medley of pleasures inside our teeming hold. Clearing the packets blocking our exit takes forever. Sweating in my seat, I wonder when I’ll next be irritated by how long it takes to deplane a flight back home. Finally, the way is clear, everyone heaves themselves to their feet and walks down the back ramp into Iraq. After the dark, cramped hold, the bright, open runway leaves everyone feeling exposed and vulnerable. People quickly shuffle over to the gear pallets, grab their bags, and head to the break in the fence that marks the arrival area. Coming into Baghdad on a military hop one doesn’t hassle with customs and immigration. Instead you just walk across the dusty runway like everyone else until you come to the open-air arrivals area. Military personnel traveling with their units are formed up along the runway. VIPs and their entourages are greeted by fellow VIPs and entourages. Those being met by friends and co-workers scan the crowd looking for same. Officers and government civilians with sidearms, enlisted with rifles, and plenty of people carrying both. Off to the side stand bearded, Western-looking men speaking with American accents and carrying automatic weapons, though clad in local clothes, that offer a glimpse into the covert ops underworld. Security elements in full ‘battle-rattle’ (body armor, helmets, weapons, etc.) talk into headphones while scanning the crowd – think sharks swimming through fish. The area is supposedly safe, walled off from the rest of the country by U.S. soldiers, private security contractors and coalition forces. The night I leave however an incoming mortar cracks the silence. The infamous ‘Road of Death’ between central Baghdad and the airport is only a few hundred meters away, and incoming planes are regularly fired upon. Walking across the dusty lot to the truck, a Toyota Land Cruiser of all things, taking me to camp I get my first glimpse of a ‘Rhino’. Built for ferrying U.S. and coalition diplomats, civilians and workers around the deadly, car bomb-laced streets, these hulking brutes bring home exactly what lies in wait outside the wall. To picture a Rhino, imagine a UPS truck bulked up with heavy armor and tiny, bulletproof windows, then add in several heavily armed men on lookout. Like nothing else, one look at a Rhino brought home exactly what everyone had just gotten into. The Land Cruiser ferrying myself and a couple of others to our base was not similarly armored however, forcing us to avoid the main roads outside the wall and instead skirt from camp to camp inside the defended airport perimeter. It took nearly an hour to go the few miles to our the dusty little camp of prefab trailers and leftover palaces that was to be my home, and basically the outer boundaries of my entire world, for the next two months. November in Baghdad, surprisingly, wasn’t as ungodly hot or dusty as I expected. By Thanksgiving it would get downright pleasant – in the 40s at night and low 70s during the day. Media coverage had left me expecting a sand blown sweatbox but the winter months, far from being hot, got downright chilly. I even saw patches of ice one morning on my walk to work. That first day though I didn’t care so much about the weather, I just wanted to figure out where I was living and what I was going to be doing. I had volunteered to go to Iraq, twice, and now that I was finally here I was anxious to see what in the hell I’d gotten myself into. I stood in Baghdad’s desert-bright sun, big green Army bags slung over each shoulder, waiting to fill out the paperwork to get into my living quarters. The process bumbled along, papers flipped and jostled, got initialed here and there, until I was finally given a key and pointed into the heart of, “our trailer park.” I crossed the road and plunged into the type of trailer park that forms the backbone of ‘temporary’ base housing in Baghdad. 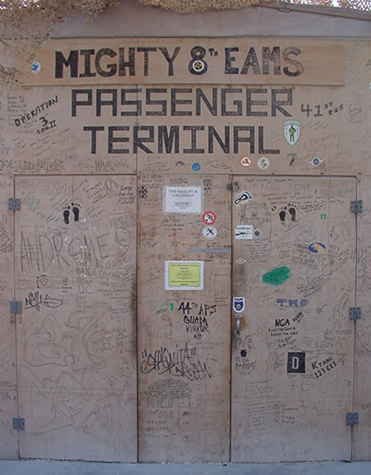 Walking past run-down trailers toward my hootch in C Block, the two days of little sleep trying to catch the hop into Baghdad and the sandstorm-induced cold I’d gotten down in Qatar had me half-delirious. It felt like wandering the set of a cheap movie. “Welcome to Baghdad! First time here?” Marcos’ (all names have been changed in this account) booming, retired Marine-officer voice woke me from my half-dream. I’d found my trailer, unlocked the door, and met my new neighbor. I’ve moved around a lot, and met plenty of new neighbors, but this was the first time my welcome chat included mortar advisories and tips on shrapnel protection. Yes, I was now in a war-zone… After that, and with a final, “let me know if you need anything,” Marcos went back to his section of the trailer. After stowing away my gear I paused for a minute and took a seat on the bed. I was a long way from my first ‘Axis of Evil’ country, North Korea, and even further away from my main duty station at the Pentagon. This was going to be different and I needed a minute to collect my thoughts before heading off to work. A couple of years before, after the North Korea trip, I’d gone back to grad school in South Korea full of fire for learning more about the North. By the time I finished my MA in Korean Studies the following year my 10 years in Asia, Korean ability, and writings on US-NK topics had gotten attention and job offers from various parts of the U.S. government. I finally settled on a ‘NE Asia Analyst’ position with the Department of Defense (DoD) in the Pentagon working for the Joint Chiefs of Staff. Unfortunately, after years of Korea-focused work and study, the DoD, in its infinite wisdom, assigned me to a China position. The decision-making seemed to involve some kind of ‘what the heck, how different can they be?’ line of reasoning. Sure, I’d visited China a few times but it was like they assumed somebody who’d vacationed in Jamaica was qualified to analyze the politics, conflicts and militaries of the Caribbean. It made me frustrated and useless from the very first day of work. The second frustration with that job had come from being deskbound. After years of work involving people, deals, and a fast, independent pace, the Pentagon desk-jockey gig was not a good fit. I knew when I started volunteering to take out the office garbage, just to get away from my desk for 30 minutes, that DC and I were not getting along well. Six months in I was climbing the walls, literally dying for a change. Finally, at a morning meeting, a ticket out appeared. My boss, clearly not expecting anyone to actually say yes, asked for volunteers to go to Iraq. Silence filled the cubicles. No one wanted any part of it, but my ears perked up. After the meeting I followed the colonel back to her office, said I was interested, and within an hour was getting deluged in deployment forms. The ‘Axis of Evil tour’, until now a bar joke with some friends, suddenly looked possible.